Perfume is inextricably linked to Egyptian civilisation. It served as an intermediary between man and the gods. It was first used in the temples and became a part of all rituals: it purified, and had its place in each step of human life, creating a contact with the divinities and serving in the rites for embalming the dead. Perfumed oils, unguents and make-up were also used in rites: every morning, the priests cleaned the statues of the divinities, then anointed them and applied make-up to their faces. With these offerings, the Egyptians made sure that the gods were protected during their journey to the afterlife, which required their bodies to remain perfectly intact. 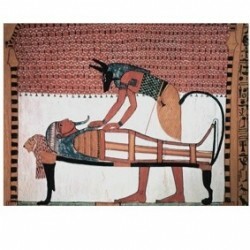 This belief explains the embalming practice which keeps the body intact using rot-proof and perfumed substances. Next to the places of worship, the temple held the rooms in which priests, surrounded by their assistants, prepared the spices to burn and the perfumed oil to consecrate to the gods. The preparations called for long months of work. The assistants ground the plants, flowers, roots, aromatic herbs and crushed resins and gums. In large cauldrons, others mixed wine, oils and honey, while the officiating priest, the head of the laboratory, read aloud the formula engraved on the walls. Some elements were not written down but transmitted orally by the priests to prevent secrets from spreading. Perfumed substances and make-up also had their effect on the living mortals, who began by using them for their magical and therapeutic powers, then soon came to see them as tools for seduction owing to their olfactory and aesthetic properties. The two best-known resins are frankincense (Boswellia sacra) and the myrrh shrub (Commiphora burseraceae). Both were imported into Egypt from the land of Punt, or Pwenet, a region that is thought to have stretched from Somalia to northern Ethiopia. Raw materials were plentiful in Egypt, but scented raw materials were also brought over from Libya, the Near East and Arabia: scented woods, pine and olive oils, myrrh, cinnamon, Indian spices, Balm of Judea. The trade in spices was widespread throughout the ancient world. Thanks to their art of perfume and spices, the Egyptians foreshadowed many of the scientific discoveries to come. Their knowledge spread as far as Asia, where Palmyra and Babylon became the two main centres of activity for perfume.